Keep in mind, I am considering Jeremiah from the last couple episodes of season 4. Eventually I'll fill in the blanks to properly finish the comparisons between both shows. Please don't freak out, I will take time to analyze more of Jeremiah during season 5. Hi everyone I'm Jack Red, today we get to talk about one of my personal favorite fictional villains of all time. DC's The Joker always felt a huge impression on me during my child hood. Even to this day, he remains as my favorite comic book super villain. Don't get me wrong I like a lot of them with insane powers but The Joker has done some ridiculous damage on his own. It's no secret both Batman 1966 and Gotham shows does have their own Joker respectively. However due to another character introduced early on Gotham. I have decided to not leave anything to chance. Therefore this will cover two major comparisons with 1966 Joker taking on both Jokers of Gotham. Now do what you will about this angle. To me we technically have two different versions on the same show. The very last thing I want to do is not include the first of them in my blog. Hell I do highly respect all of them. Each one brings something unique to the character that seems to stand the test of time. Really this could do all over the place. I expect no less for Batman's Nemesis. A character filled with mysterious leaving people to picture in their own minds exactly why he is this way. To clarify Jerome is basically the proto Joker in every sense of the word. Although some things that happened to the characters in the comics did happen to him. Now this would've excluded if he wasn't anything like The Joker at all. I already had to do that on the villains side. Keep in mind the times were very different for these shows. Batman 1966 was a much lighter show that had to greatly tone down The Joker. Fortunately they chose a great actor to do him on the show & movie. This show was meant of testing your wits and a weird sense of humor. The Joker appears in a lot of episodes with most of them being great. I should mention The Joker is wearing hot pink clothes instead of his usual purple ones. Cesar Romero refused to have his mustache shaved off. They chose to simply put extra white make up on his face to help cover it up. The Joker is usually shown without facial hair. This Joker laughs a lot with him being up there with many great actors that portrayed the character. True to his name, he did cause a lot of chaos in Gotham. Jerome was the son of two circus performers. He killed both his parents without any remorse. Quickly appointed to be the leader of a group of maniacs. Jerome got revived to start causing mayhem all over Gotham. More recently he attempted to kill Bruce Wayne. Now he is lock up at Arkham Asylum. 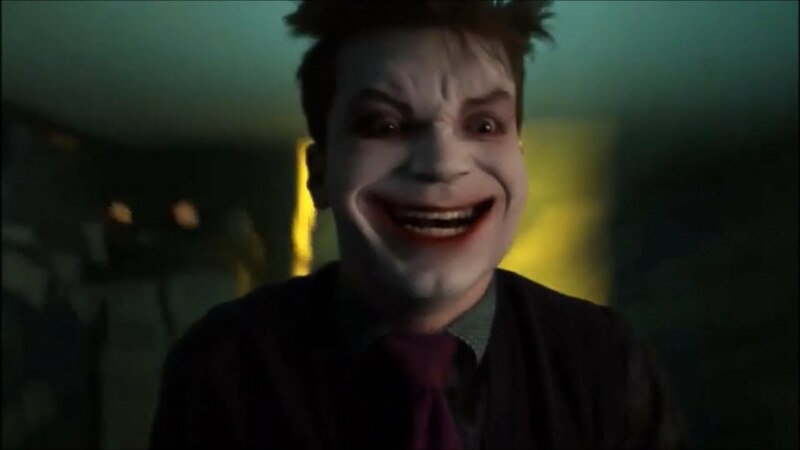 Jerome acts just like what you expect of The Joker in every possible way. Not only he laughs, he causes some mayhem that would give Batman 1966 Joker a run for his money. Jerome is very convincing at what he does. I don't see why a lot of people were very surprised to hear he isn't The Joker. Although for what he does bring to the table Jerome does have my respects. Way better than Jared Leto's take in Suicide Squad movie. Hell it is a huge honor for him to being the inspiration for the actual Joker. This is going to be a close show down between a real Joker and someone whose not quite him. I think what it really comes down to is which one felt more like the character. A guy all about causing chaos, killing thousands of people, blowing stuff up and attempting to corrupt Batman. In most of his appearances in 1966 show, The Joker does cause a lot of chaos with some ridiculous concepts. In some cases he attempted black mail for money. Jerome does nail more what I expect of him in areas 1966 version doesn't. He is betraying everyone he works with just like his comic book counterpart. Yes both characters laugh but I still give Romero's more praise. I do like Jerome's laugh but it is still not enough to compete with that. In appearance 1966 version easily wins. Jerome uses weapons you expect from criminals & maniacs. 1966 version uses all kind of ridiculous weapons. In that regard does make that version more faithful to the character. Both has fought Bruce Wayne but it felt more right in Jerome's case. Despite not being The Joker, he is clearly his inspiration. Both of them did freak the entire Gotham City out. I think I have to give this to 1966 version for a few good reasons. He is a bigger thorn in the police's side. If you seen some of his most ridiculous episodes. You already know what I'm talking about. For those that haven't seen the show or episodes I'm about to reference. There is an episode where The Joker built an UFO tricking people all over the city. There is another episode where he doesn't paint in a painting contest to end up winning it. Only to black mail a couple of rich people for money. Yes this by itself isn't faithful to the character. I would bring up forcing Batman into tough situations but many villains also done that on the show. Even in bad episodes, this version of him does stand out in many ways. I'm not saying the actor for Jerome isn't great. Honestly he blew me away within minutes of seeing him in action. Clearly he is one of the better TV versions of the character. I felt in some ways 1966 Joker just has exactly what it needs. Sure there are some criticism I could see people saying about him. In the end 1966 Joker has more major things going for him. Even if I excluded the movie, he has difficult to believe episodes. The Joker stands as one of Batman's greatest enemies for great reasons. I felt this version fit those better than Jerome. I do remember both of them a lot. 1966 Joker is simply more of the actual characters in ways it matters. Now since I covered a great deal about Batman 1966 Joker. I am mostly going to focus on Gotham's Joker. It turns out Jerome had a twin brother named Jeremiah. He planned not only his death but also made sure his brother became his successor. Unexpected happened where a new gas turns Jeremiah's skin to white, his lips red, his pupils are a different color & acts very differently. Obviously Jerome was insane that wanted to cause Hell to the city. His brother wants to destroy it all to rebuild it in his imagine. Jeremiah can clearly see how insane his brother was. At the same time he won't let people get in the way of his goals. This guy has more of the critical traits of the character that Jerome simply lacks. For starters Jerome didn't wear much purple clothes. He needed help to build things like different types of gases. Jerome was insane at a young age while parts of it are deeply covered up by his brother. Even Jeremiah confirmed the gas didn't actually affect his sanity because he already was insane. Jeremiah does a great job acting more faithfully to the character. It is a real shame because of DC cinematic universe, Fox isn't allowed to call him The Joker. It shouldn't effect people liking him a lot. He has been doing things The Joker very likely would do in the comics. Jerome didn't have a obsession of Bruce Wayne while his brother does. Two very different takes of the character on two very different shows. The Joker on Batman 1966 is a heavily toned down version meant for comedical purposes. Jeremiah is a much more serious take that may lack the hair color & title. Both of them sure cause a lot of chaos on their respective shows. Two of my favorite Joker actors in TV shows. Jeremiah is much more complex out of The Joker on Batman 1966 & his brother. The Joker was already the character from the start on Batman 1966. Unfortunately during it's final season, The Joker was given some terrible episodes. Also some of his appearances he is seen wearing mostly hot pink instead of his usual purple. There is no question, The Joker on Batman 1966 is more faithful in terms of having his own gadgets. How Jeremiah goes about things is more accurate to the character. This is going to be difficult no matter how I go about it & in all honestly it should be. After all, The Joker always has been Batman's greatest enemy. Another reason why this is so hard because Jeremiah isn't in as many episodes as The Joker on Batman 1966. At the same time, he haven't gotten a bad episode. Which is one thing he has over the other version of the character. However The Joker on Batman 1966 does laugh a lot. Jeremiah doesn't laugh often except when he was becoming the character. I felt this might even come down to the little things. Jeremiah with Ra's al Ghul's help trapped whoever was in Gotham causing all kind of chaos in the process. Jeremiah also had that level of interest in Bruce Wayne similar doing that with Batman in the comics. Also the way they went about Batman 1966, technically The Joker along with Catwoman, The Riddler and The Penguin are his arch enemies. Now I know I'm already doing this comparison before even watching the final season. I already decided to do a extra part updating most comparison between the two shows. With that being said I have slightly have more reason to give the win to Jeremiah. He is mostly wearing purple even before becoming the character. Honestly Jeremiah tricks people the same way the character does in the comics. He never wanted money or control over people. All he truly wants is to cause chaos on a big scale. In vice versa, The Joker does want those things. When he is causing chaos, he simply doing it to get Batman's attention. Which was a very common thing the villains would do on that show. Jeremiah is mysterious just like the character. He has done terrible things that could scar people for life. Believe it or not, even back then The Joker has done bad things in comics. Obviously Batman 1966 version is based on older comics while Jeremiah being more based on new 52 universe comics. A very clear difference in almost everything imaginable.